Divemaster in spain course with the PADI professionals! Who should take the divemaster course in spain ? Love scuba diving? and want to share it with others on a whole new level? why not take the PADI Divemaster course and do what you love to do as a career. Scuba divers look up to divemasters because they are leaders who mentor and motivate others. As a divemaster, you not only get to dive a lot, but also experience the joy of seeing others have as much fun diving as you do. The PADI Divemaster in spain course is your first level of professional training. Working closely with a PADI Instructor, you’ll fine-tune your dive skills, like perfecting the effortless hover, and refine your rescue skills so you anticipate and easily solve common problems. You’ll gain dive knowledge, management and supervision abilities so you become a role model to divers everywhere. Getting paid to do something you love doing is everyone’s dream & that’s exactly what PADI Professionals do. With a PADI Dive Master certification card you’ve got a skill transferable to anywhere in the World where there’s water. PADI professionals have this choice. With PADI & Adventure Divers you can join the ranks of professional divers who wake up every day to be paid to carry out the thing they love! As a PADI member, you will become part of the most successful company in the diving industry. At Adventure Divers, we offer you the choice of doing the basic course between 4-6 weeks or the more desirable internship program. you will need to purchase the divemaster theory pack before or on arrival to spain. If you are looking for the first step in working with scuba diving as a career then you can take our Internship course which will take you through from Advanced Diver to Divemaster. As you will be working with the staff at Adventure Divers & using a hands on approach you will gain valuable experience that people don’t receive when just taking courses as usual.If you put together the costs of taking each individual course then you will find it can work out an expensive way to learn, so why not study & gain valuable work experience while completing the courses & save yourself a bundle while being in a hot, sunny and beautiful part of Spain & diving in the Mediterranean sea !!! Over a period of 12-14 weeks (usually june to september) we will teach you the Advanced, Emergency 1st Response, Rescue diver & Divemaster course’s while you gain the valuable knowledge of how a dive operation works , interacting & diving with people of all ages & abilities & getting lots of dive experience under your belt. 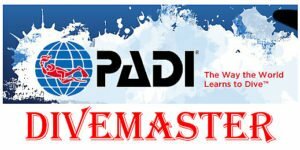 Your adventure into the professional levels of recreational scuba diving begins with the PADI Divemaster program. Working closely with a PADI Instructor, in this program you expand your dive knowledge & hone your skills to a professional level. PADI Divemaster training develops your leadership abilities, qualifying you to supervise dive activities & assist instructors with student divers. This course is only for people who are dedicated & serious about gaining their Divemaster rating & willing to work & dedicate 12-14 weeks starting in june. You will need all diving equipment for the course so please make sure you have purchased everything or ask us to purchase it for you at a discounted rate when you arrive. The internship generally lasts 12-14 weeks during which time you will learn not only the science of diving in more detail but also the art of managing students in your care. You will need to get accommodation for the duration of the internship, we can help you find low cost accommodation, please ask if needed. 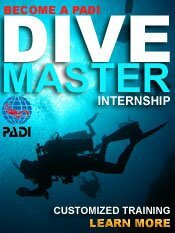 Please contact us by going to our Contact Us page and sending us a message about your interest of doing our Divemaster in spain Internship, we will send you more details of the course. Or for more details call us for an in-depth chat about this fantastic way of learning and to get the full details .